With no login info specified, going into explore youtube and entering any category gives me the popup "Error" with text "" . This also happens on a second install of xbmc both on win 7. Is this a known issue or do I need to get a log? cruzannavy Wrote: No the plugin still works, you can still play trailers from youtube via movie library, and oyu can still use the youtube addon to browse videos and play them , but I cant login to my youtube account via the plugin since the site change. same here, can browse and play popular stuff etc... just can't login and access subscriptions etc... this should get updated automatically right? just need to be patient? Yeah, we've fixed this bug in our trunk. We will be pushing a new version to the repo very soon. Anyone else having problems with the search function? 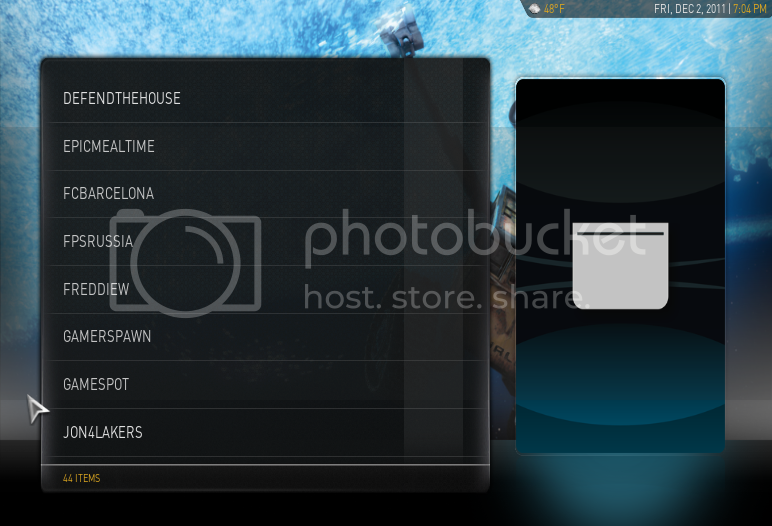 Press search, edit search tag ... And then nothing ... Xbmc crahes and have to close the process with ctrl alt delete. Using latest nightly, latest youtube ver. On win7. butchabay Wrote: Anyone else having problems with the search function? This is most likely an XBMC issue, and not a plugin issue. TobiasTheCommie Wrote: This is most likely an XBMC issue, and not a plugin issue. Thanx for reply, i'll try first to clean up my install, because i have several other problems not related to youtube. I'll report back. Heh, sounds like a plan then. And honestly, if you are on Dharma, just try upgrading to Eden. TobiasTheCommie Wrote: Heh, sounds like a plan then. If i set Safe search to: Moderate i get the crash, else it works on strict and off. Working on all safe serach, Moderate, Strict and Off. I'll post my issue in the respective thread. it's not out? if i were to get a nightly, i'd need to upgrade again for the stable right? cami Wrote: it's not out? if i were to get a nightly, i'd need to upgrade again for the stable right? Pull request has been sent. - Changed All videos now have a unique path from xbmc's perspective eventhough they're present in different folders. - Changed downloader into a seperate service. We will no longer be providing zip files for our releases, since that has become unfeasible.